You can always count on a pub to be the one place you want to go where everybody knows your name — which is especially true for the townsmen who congregate at Brendan’s pub for their daily pint. However, all familiarity gets shaken up when a mysterious woman enters the bar and the men instinctively regale her with fascinating tales of spirits from the past and present. But one story proves to be much more chilling and real to the men than they could ever imagine. 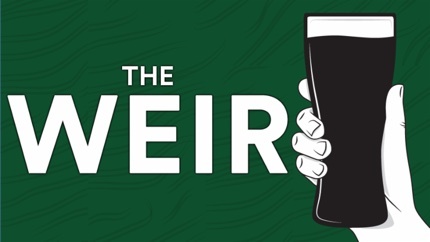 Winning the Laurence Olivier Award for “Best New Play,” this haunting production of The Weir makes its NVA debut! For more info (and to buy tickets) click the link. We’ll be serving up the tastiest brats and traditional German fare, along with healthier choices. And Oktoberfest wouldn’t be complete without bier, pretzels, und scrumptious Bavarian desserts. . . You’ll be entertained the whole day through with live music, pumpkin painting with the kids, photo booth, and our NEW costume contests! To buy tickets click here. For all the other official details, please click the link. Want to spend a great day on your bike while rolling through Carlsbad, Encinitas, Solana Beach, Del Mar, and Oceanside? Then the Tri-City Medical Center’s Bike The Coast on October 10, 2015 may just be that day. Bike the Coast – Taste the Coast is a recreational bicycle ride offering a choice of 7, 15, 25, 50 and 100-mile rides starting and finishing with food, beer garden, sports expo and music at the Oceanside Pier on Saturday, October 10, 2015. The cycling courses include the San Luis Rey Bike Trail and San Diego’s North County beaches of Oceanside, Carlsbad, Encinitas, Solana Beach and Del Mar. Proceeds from the ride support the San Diego County Bicycle Coalition www.sdcbc.org — a 501(c)3 non-profit organization dedicated to making bicycling better in greater San Diego. 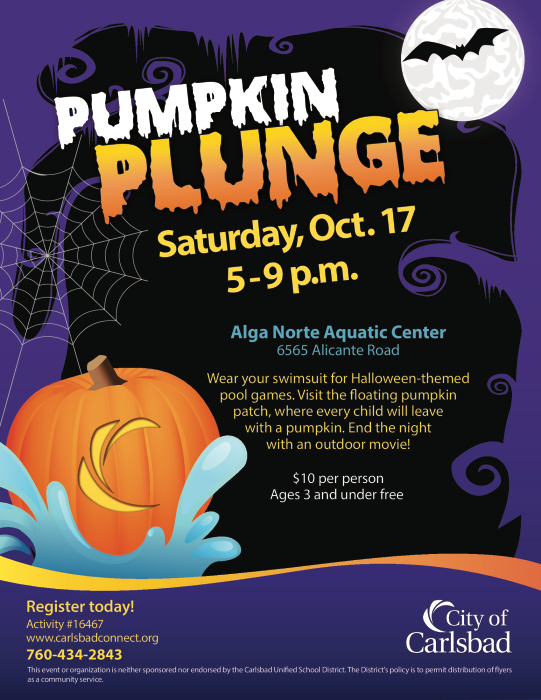 The City of Carlsbad will be hosting a Halloween pool party on Saturday, October 17, 2015. Where your swimsuit for Halloween themed pool games. Visit the floating pumpkin patch, where every child will leave with a pumpkin. End the night with an outdoor movie. The Pumpkin Plunge costs $10.00 per person. Ages three and under are free. For more info click the link. 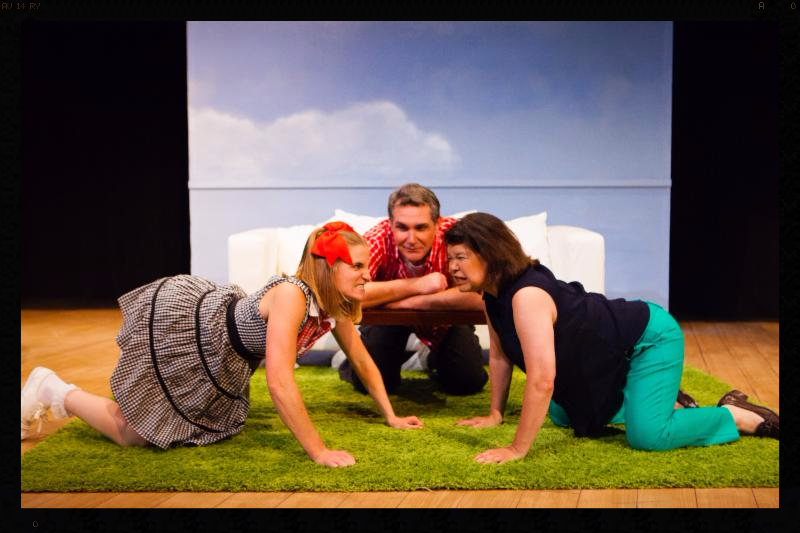 After a successful run earlier this year that doggone comedy Sylvia is returning to Carlsbad’s New Village Arts Theatre for a limited engagement January 7-24, 2016. If you don’t know, here’s a little reminder on what the play is about. When Greg adopts a dog named Sylvia, or rather is adopted by the street-smart mutt, Sylvia (played, alas, by a human) soon turns into a bone of contention for his wife Kate. In this romantic comedy by A.R. Gurney, the author of Love Letters, the long-married empty nesters have to dig their way out of an unexpected hole: Kate feels that she’s losing Greg to his adoring new best friend. This imaginative take on a midlife crisis leads to lots of laughs and thoughtful insights on love, marriage, jealousy and canines. For more info (or to buy tickets) please click the link. Nothing better outlines the outrageous lengths to which LA based shopping mall developer Caruso Affilitated will go in their campaign to obfuscate the truth about their development plans than their own disinformation ads that have been running non-stop on the web and local TV. 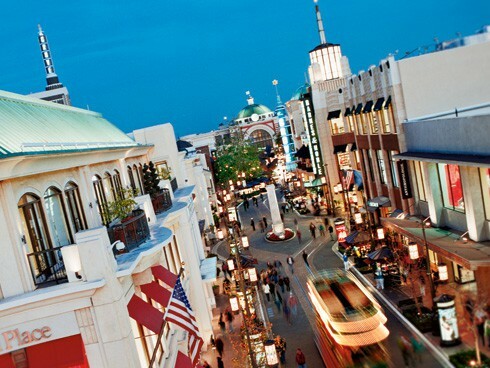 For a reminder of what Caruso Affiliated shopping malls looks like, check out their own photo of The Grove below. It was probably named after the nursery grown trees they sandwiched into holes in the concrete outside of Pottery Barn Kids. Nice use of open space, huh? Oh, and remember: Please Sign The Referendum Click here for locations. Anti mall sticker as seen on the seawall. We believe that placing a shopping mall on the shores of Carlsbad’s Hedionda Lagoon is such a ridiculously dumb idea that we’ve found it difficult to even comment. Exactly why it’s foolish seems so obvious as to make listing the reasons redundant. We’ll cut to the chase: The Carlsbad City Council believes putting a mall on the lagoon is such a good idea that they approved Los Angeles based developer Rick Caruso’s plans without even asking the citizens of Carlsbad to vote. 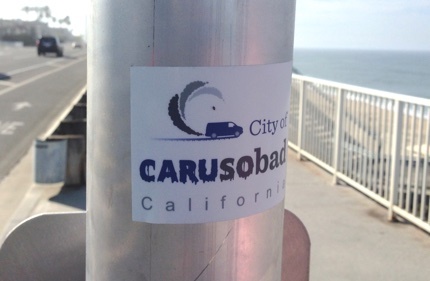 Luckily a group of Carlsbad citizens (Citizens For North County) believe we should vote on it. That’s why they’re out getting signatures for a referendum that will overturn the Carlsbad City Council’s approval and put the Hedionda Lagoon Mall up for vote to everyone in Carlsbad. If you think the citizens of Carlsbad should have a voice in deciding the future of the community and a beautiful piece of open space on the shores of the Hedionda Lagoon, then you should sign the referendum. This afternoon (Friday, September 11, 2015) you can sign the petition at the corner of Highland and Basswood from 2 PM to 6 PM. Or stop by the Dove Library (at Dove and El Camino Real) to sign. 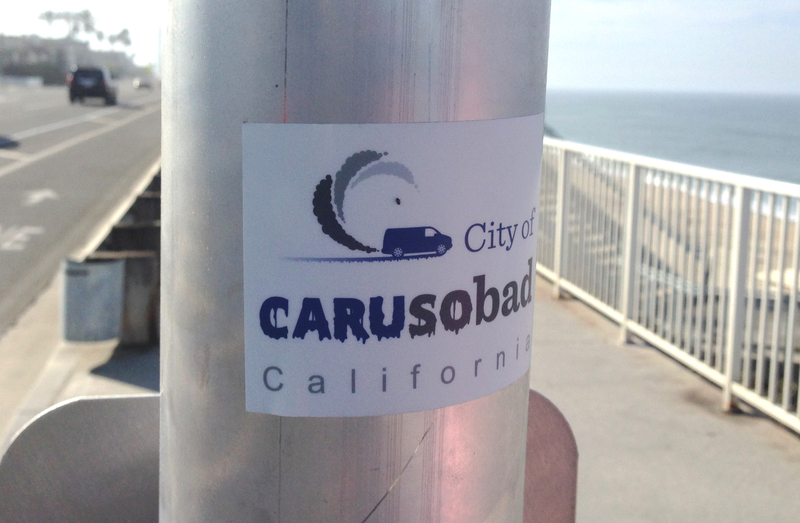 All your signature means is that you’d like the people of Carlsbad to have a vote on the Mall.